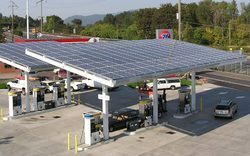 Solar Power Pack for Fuelling Stations. Available from 1 kW to100 kW single phase & three phase output. Built in high efficient MPPT Charger to utilize maximum available solar Power. Advanced communication features for remote monitoring of system performance. AC energy meter for PCU output measurement & monitoring. 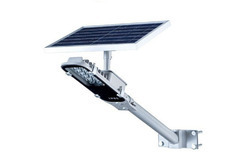 High power LED light available from 4 - 80 W.
Strong and safe Aluminium housing with IP 65 protection. 6-11m corrosion free galvanized pole. Microprocessor based charge controller and LED driver. MPPT charge controller which meets IEC standards. Polycrystalline solar panel which helps in improved efficiency. Low maintenance Tubular Battery with low discharge rate and long life. Dusk to dawn auto ON/OFF by sensing solar panel output. Hybrid version optional for AC backup. Looking for Solar Power Energy ?